The path to your future business career may seem unclear and complicated—let the Office of Career Management help. 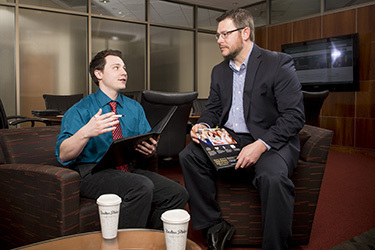 We provide expert guidance for all students of business—from incoming freshmen to alumni. Choosing the major and career path you wish to pursue is an ongoing process. As you continue your education and develop new interests, your path may change. Some students enter Wright State and know exactly what they want. Others have a field of study in mind, only to change it or add a minor as interests shift. Some people have no clue. Wherever you are in the process, we are here to help. Start by reviewing the Raj Soin College of Business Degrees and Programs page. Here, you can see all programs of study offered at RSCOB. Information includes degree overview, example curriculum, and what kind of career paths might be available upon successful completion. You will find contact information for specific departments here as well if you would like more information. Remember, our advisors and faculty are here for you! We would be glad to discuss your skills, interests, and values and help you find a path that fits. Make an effort to meet one-on-one with at least one member of the Raj Soin College of Business early in your time at Wright State. Email us at rscob-admin@wright.edu or call (937) 775-2437 to set up an appointment. Freshmen – we strongly encourage you to take this one credit class, even if you already have an idea of what major you would like to pursue. Think of it as an introduction to being a business student at the Raj Soin College of Business. Led by academic advisors and career management professionals, you will gain valuable insight into business careers, academic paths, and the resources available to you as an RSCOB student.